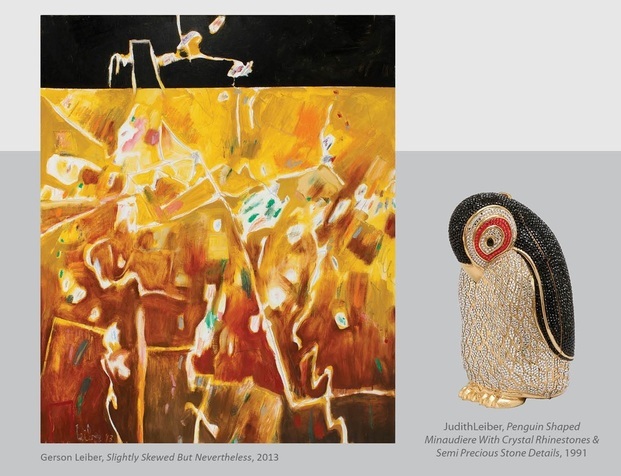 The Flomenhaft Gallery is proud and so excited to exhibit the art and artifacts of two giants of our cultural world, Gerson and Judith Leiber. For over 70 years, from the day they met, theirs has been a match of love and encouragement – each to the other. It all started during World War II. Gerson, who grew up in Titusville, Pennsylvania, was drafted into the US Army. As a radio operator, he was sent to Budapest in 1945 to work with a commission observing the Russian liberation of Eastern Europe. The very first day in Hungary he met a young girl, Judith Peto, and life changed for both of them. They courted, and were married one year later in Judith’s parents’ apartment. The war had ended, and in 1946 they travelled on the first bride ship General Barry to the United States. Hungarian Jews had suffered a great deal during the war. Hungary was a Nazi ally. Food was scarce, Judith’s father was taken to a work camp to dig trenches against the possible on-coming Russians and the Jews were put in ghettos where they cowered in cellars during the bombings. But with great dignity, Judith says only that they were lucky, because they survived. Also during the war, the Hungarian government severely limited Jews from going to the University. However Judith needed to do something, so her parents helped her get an apprenticeship with a Jewish handbag manufacturer, named Pessi. There she learned a great deal about making fine handbags. When she and Gus came to the United States she found work, and was so talented, she became the only woman handbag sample maker in America. Her skills became well known and very sought after. When she lost her job working for a firm that experienced financial hardship, she opened her own business, Judith Leiber Handbags. Her bags were so creative that in 1991, Richard Martin, who was the executive director of the Shirley Goodman Resource Center of the Fashion Institute of Technology and later became the curator of the Costume Institute of the Metropolitan Museum of Art, wrote: “Judith Leiber’s art is no mere fashion accessory, but an art of the hand for the hand. In elegant simplicity, Judith Leiber gives us all something to cling to.” Indeed many of our President’s wives wore Judith Lieber handbags to their husbands’ inaugural balls. These bags are all in the Smithsonian along with others. The Metropolitan Museum of Art has 88 of Judith’s bags in their collection and the Victoria and Albert Museum owns one. When the tide of the war moved on in Hungary, Gerson was still stationed there. He threw himself into the cultural life of the Hungarians, visiting artists and museums, also the opera which he and Judith love to this day. Interested in art as a career he went to the Royal Academy of Art where he received accolades from his teachers. On returning to the US he taught art for many years In the Newark School of Fine and Industrial Art. He also continued his studies at the Art Students League where one of his teachers was Will Barnet with whom he studied graphics. Later studies took place at the Brooklyn Museum, and there Gabor Peterdi had considerable influence on his growth as an artist. Gerson became a master printer and superb in the medium of charcoal drawing. We are fortunate to include several of Gerson’s graphics and drawings in our exhibit. Others are included in over 60 museums. From about 1960, Gus began to paint with a sure commitment, and in an abstract expressionist way. In these works, many of which we exhibit, nature seems to have taken strong roots possibly inspired by the showcase garden he has created in their Amagansett home. There is also humor and an interior rhythm in Gus’s paintings that seems to meld together with his absolute command of color.